In this article, we will show you, How to Write C Program For Strong Number Using While Loop, For Loop, and Recursive Function. 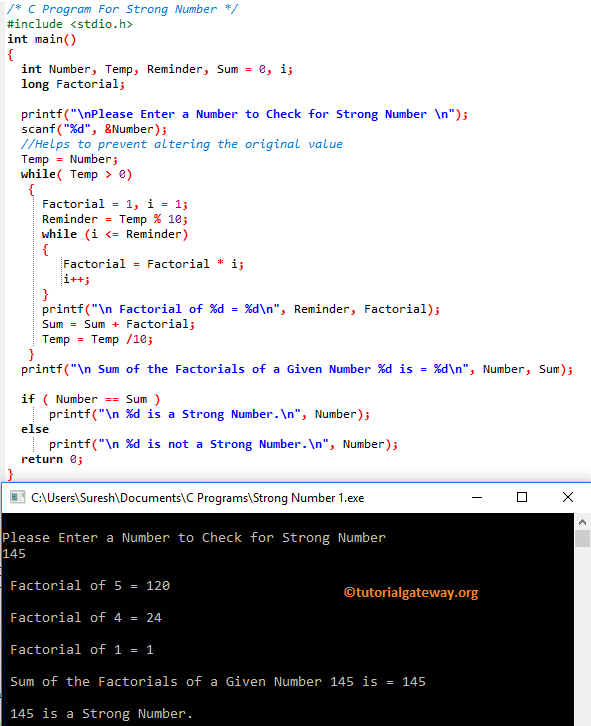 This C strong number article will also show you, How to write a C program to print Strong Numbers between 1 to n.
This program for strong number in c allows the user to enter any positive integer and will be assigned to Number variable. Next, we are assigning the original value to the Temp variable. This will help us to preserve our original value while we do all the manipulation on Temp variable. Below While loop will make sure that, the given number is greater than 0. Statements inside the while loop will split the numbers, and find the factorial of individual digits inside the given number. If you don’t understand the logic, Please refer C Program to Count Number Of Digits in a Number article. Here, First while Loop (Outer one) in C strong number program will split the number into individual digits. Next, the inner while loop will find the factorial of that digit. I suggest you to refer C Program to find Factorials of a Given Number article to understand the logic behind the factorial. Now, it will enter into Inner While loop. Here it will calculate the factorial of 4, and that is 24. This strong number in C program allows you to enter any positive integer. And then, it will check whether a number is a Strong Number or Not using Recursion concept. Here, you can also try normal function to calculate the Factorial. This C program for strong number allows the user to enter a minimum and maximum values. This program will find C Strong Numbers between the Minimum and Maximum values. This C strong number program allows the user to enter a minimum and maximum values. Next, below show For Loop helps the compiler to iterate between Minimum and Maximum Variables, iteration starts at the Minimum and then it will not exceed Maximum variable.